We have put together a few tips to help you in choosing the right garden building for you. 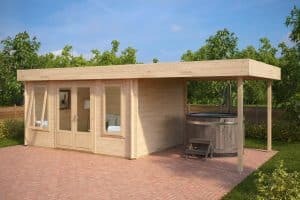 We will also explain some important features that affect the cabin price and why some garden buildings that look similar on first sight, have remarkably different price tags. Finally we will highlight some useful optional extras that may be of interest to you and worth considering. Before we go in to technical details, there are two very important factors to consider when choosing your ideal cabin. Firstly… size really matters, it is very important to figure out the size you need before you start your search. 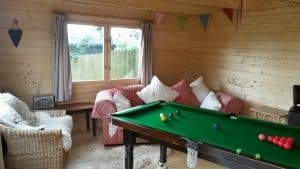 For example, if you are looking for a garden billiards room, you should not only have enough space to play around the pool table, but it is really nice to have some extra space in the room for seating as well. Or, should you be looking for a garden office, make sure it is a comfortable space to work in and allow for storage of files etc. Make sure, whatever you are planning to use the room for, the size will enable you to do it comfortably. One garden building can have several functions. This is good to consider, especially if the space in your garden is limited. 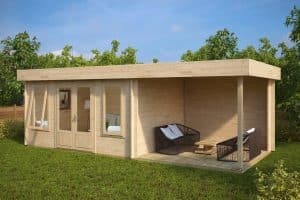 For example, here is 12 m2 garden room Jacob D, but spend a little extra and you can have the same summerhouse together with a generous canopy to make a cozy garden dining area or outdoor kitchen area. 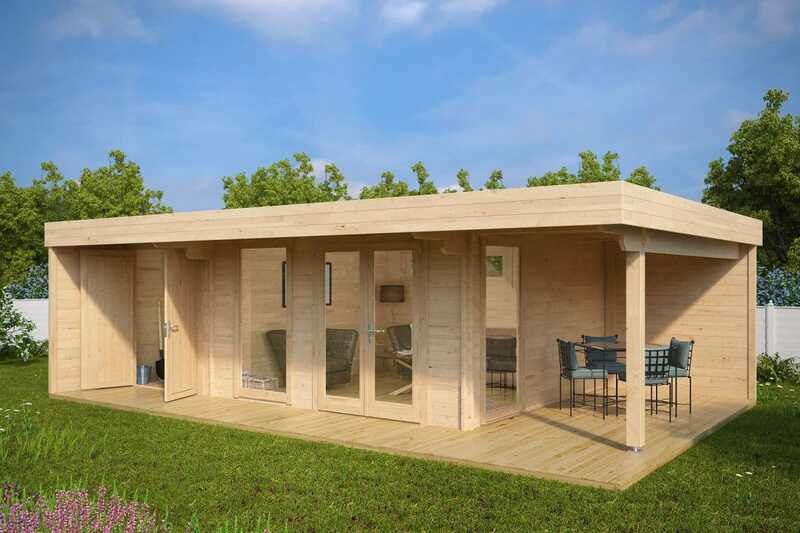 You can have a garden room, shed and a veranda all in one garden log cabin. Besides saving space in your garden, this log cabin is also considerably less expensive than buying a summer house, gazebo and a shed. Wall thickness is something you don’t see when looking at the cabin image. However, this factor can have a huge impact on the price of your cabin and makes a big difference. 28mm, 40mm, 44mm, 50mm and 70mm thick walls are the most commonly used thicknesses for garden buildings. Our general advise is that you should not go for anything under 40mm planks unless you are simply looking for a small storage shed. Greater wall thickness makes your garden building sturdier, more resistant to temperature changes and finally its life span will be considerably longer. We use 40mm wall thickness for medium sized seasonal garden buildings and our favorite 44mm and 50mm wall thickness for our premium end log cabins. Finally, we use 70mm planks for extra large garden log cabins. Cabins with 40-70mm wall thickness come with additional metal rods to be inserted into walls for added strenght. Double glazed windows and doors are included in the standard price on any garden building with a wall thickness of 44mm and above. Talking about windows, if you intend to use your log cabin all year round, then forget about single glazed windows. 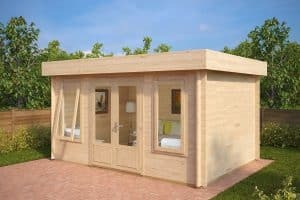 To make your garden office building or hobby room usable 365 days a year, your garden log cabin needs to be insulated, and double glazed windows are absolute must. 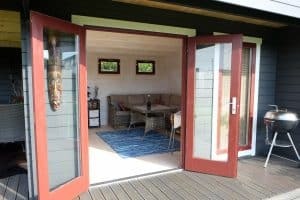 All Summerhouse24 garden log cabins with 44mm walls or thicker have double glazed windows and doors in the standard kit and cabins with 28mm and 40mm cabins for seasonal use have singled glazed windows. Everything you need to assemble your cabin is included in the standard kit and even more than many of you can expect. All our cabins have fair standard prices without hidden extras, which means that thin 10mm roof boards instead of proper roofing boards or floor boards for an additional cost are not the case when you buy a Summerhouse24 garden log cabin. All you need is a proper base and tools to get the job done and have your cabin installed. We do have some handy extras that are worth considering. First of all you may consider our professional installation service. Log cabin assembly looks really smooth and easy on the numerous youtube videos you can find, but be honest with yourself. If you struggle with putting a nail in the wall and you don’t have any previous experience with installing furniture or garden structures, you should strongly consider our installation service or at least involve someone who can when attempting assembly. 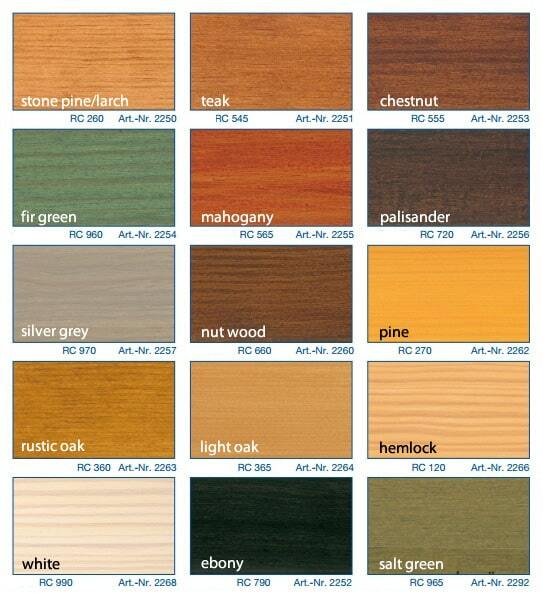 For an additional cost we offer premium wood preservatives from Remmers. We recommend coating your cabin with wood preservatives or paint as soon as you have assembled it. Remmers HK Stain requires just two coats without primer. That will protect your cabin from sun, UV, moisture and rotting for the next 5-6 years, without a need to retreat. Alternatively you can visit your nearest DIY store to find the paints or preservatives you like. All our cabins come with basic roofing felt that is good to protect the roof for some time or act as a great underlay, but Icopal roofing shingles for apex roofs and Firesmart self adhesive roofing felt for pent- and flat roofs are ideal and practical extras to order. Icopal bitumen roofing shingles for apex roofs will upgrade the outer look of your cabin and easily last for the next 10 to 15 years. You can choose between black, gray, red and green shingles. Icopal Firesmart self adhesive extra strong roofing felt is very easy to install and offers the best possible protection for your cabin.